On the 23rd February 2019, Sensei Zahari Damyanov, the current absolute World Champion was in London to lead an open seminar hosted by the BKK’s Sensei Hristo Lyubenov at his Ichi Geki dojo in Bounds Green, alongside BKK Chairman and IFK Secretary General, Shihan Liam Keaveney. The seminar was attended by a number of Kyokushin groups (BKK, IFK, Kyokushin-kan, Shinkyokushin,IKO1, KWU, EMAR) all with a common goal of knowledge sharing, developing Kyokushinkai, and building strong friendships old and new. IFK Bulgaria hosted their Summer Camp in Primorsko by the Black Sea from the 27th June to 4th July with approximately 150 students attending the course, led in the main by Shihan David Pickthall with instruction also from Country Representative Nikola Blagoev and also guest fighting sessions from Senpai Aneta Meskauskiene of IFK Ireland. On 2-9 July 2017 the biggest in the World, International Kyokushin Summer Camp was held. Nearly 1300 participants, representing IFK, Kan, KWF and AKR, were accommodated in six hotels and practiced at the Kamchiya Sports Center. The opening of the camp was made by: Sports Minister of Bulgaria Krasen Kralev, shihan Andre Drewniak, shihan Dawid Pickthall and shihan Ivo Kamenov (main organizer). The program included two obligatory training sessions per day, at 8am and 6pm. The participants were grouped as follows: black belts, brown and green belts, yellow and blue belts, children and a separate group of fighters. Volunteers could also take part in a Iaido sword training. Training sessions for black and brown belts were run daily by shihan A. Drewniak (KWF) and shihan D. Pickthall (IFK). World champions Zahari Damyanov (Kan) and Sergey Plekhanov (KWF) as well as other Bulgarian masters, such as shihan Asen Asenov, shihan Marin Mitev, sensei Nikolay Rachev and senpai Petar Martinov, led sessions for the sports group and others. Shihan Ramil Gabbasov conducted daily training classes for 80 international KWU judges. The Professional Grand Prix of Bulgaria was held on 5 July. The President of WFKO Aleksander Tanyushkin from Moscow opened the event and the main judge was shihan Andrey Bura. Fighters fought five rounds of 2 minutes each, with a minute’s rest. The first match was won by Aleksander Drozd (Russia) who defeated Andrey Andreev (Bulgaria). The second one was won by Nikolay Yorgov (Bulgaria) who defeated Naoki Morita (Japan). 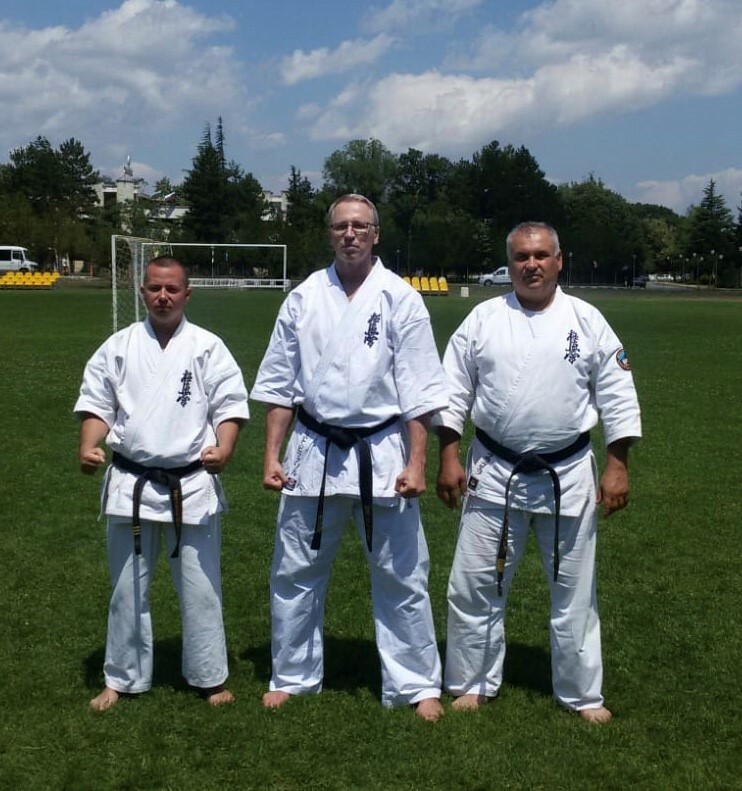 The organizer was the Kyokushin Bulgarian Federation led by shihan I. Kamenov. Shihan Hatsuo Royama came at the end of the camp to take part in the International Youth Tournament, dan exams and a farewell photo session. On 7 July was held the International KWU Youth Tournament “Varna Cup” with the participation of about 130 fighters from 16 countries. The main judge was shihan R. Gabbasov and it was opened by shihan A. Drewniak on the behalf of KWU. Prizes were given by shihan H. Royama, shihan A. Drewniak, shihan M. Mitev and sensei N. Rachev. The event was organized by the Bulgarian Kyokushin Federation headed by shihan I. Kamenov. On 8 July dan examinations were held, supervised by Shihan H. Royama and shihan A. Drewniak. In the evening the official closure of the camp and a photo session took place in which participated shihan H. Royama and shihan A. Drewniak, as well as all leading instructors. Late in the evening in Varna a Sayonara party for about 400 adult participants was organized in the Rappongi Restaurant. IFK European Championship results (Adults) Junior results to follow.